The Masters of the Universe Classics releases I’m looking at tonight are a bit of a mixed bag. The Faceless One and Battleground Teela are both fine additions to the MOTUC line, and they have two things in common apart from being released in the same month: 1) They both made me do some research and 2) Neither are likely to find their way to the front of my display. The Faceless One is one of those MOTUC characters that I had to do some research on, as I hadn’t heard of him before. I don’t mind this aspect of the MOTUC subscription – it’s fun to discover new aspects of the MOTU Universe, be they aspects of the original Masters world, or clever additions from Mattel. In this instance, the revelation (to me) that The Faceless one is actually the father of Evil-Lyn was pretty cool, and put aside any thoughts I might have had about not keeping this particular subscription figure. From the solicit photos, I thought this was going to be a rather plain looking figure. While The Faceless One’s headsculpt unsurprisingly lacks detail, there is still a fair bit happening here - most prominently his very detailed cape, which incorporates a hood, two tones of colour and shoulder pads that would make Joan Collins green with envy. It’s a removable piece which allows you to appreciate the detail underneath. 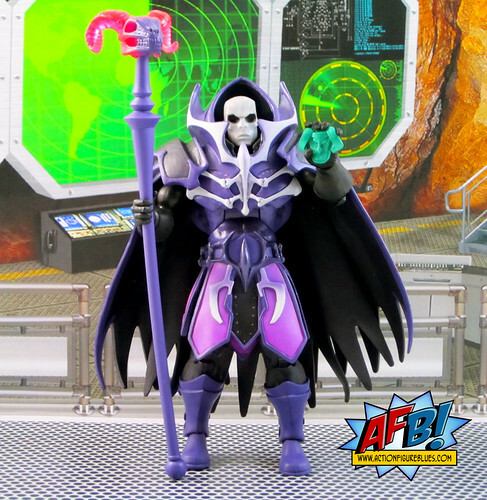 The Faceless one comes with a staff, called “The Havoc Staff” and a gem called “The Ram Stone”. These are notable accessories simply because they’re unique to the line. The amount of effort that has gone in to this figure certainly helps justify this character’s place in the line. He’ll be in the back row of one of my MOTUC shelves, but I do feel like he’s earned his space in the collection. Battleground Teela is another character that led me to research. I’ve learned enough about the way Mattel is managing this line to know that you can usually count on there being a story behind the releases that seem odd, and this one certainly did for a few reasons. 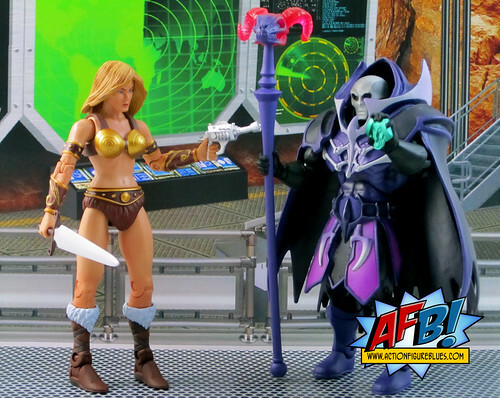 Teela, of course, is a major character in the MOTUC Universe, and this is a reasonable variant which will match others in the pipeline, such as a Battleground Evil-Lyn figure which has been previewed. The particular issue that led me to the Google Machine was trying to work out why Teela has blonde hair in this incarnation. I was pretty stumped as to why she wasn’t sporting her trademark red locks. Thanks to my friend Daniel at It’s All True, I found this great article on “Blonde Bikini Teela”, and found that this look has its origins in a 1982 DC Comics series that showed some different designs for the He-Man characters. Some of the elements of this comic were adapted for the Filmation animated series, but this look for Teela remains unique to those particular comics. Even though this bit of MOTU history doesn’t resonate with me personally, I loved finding this out, and it really makes this figure make sense. I love the little “nods” that Mattel makes to the history of these characters through toys like this. I also like the bio that Mattel has created for this version. It doesn’t however, make the blonde hair make sense. I think Mattel could have paid an homage to the legend of this early Teela version without using the blonde hair, and thus integrated this figure a bit better into the new MOTUC legend. Hair colour aside, the main issue I have with this version of Teela is her facial expression. When I hear “Battleground”, I’m expecting something a bit savage or intense, but what end up with is a stock standard neutral visage. It looks fine, but lacks the edge that I’d like to have seen to really make this figure stand out. Apart from that issue, this is a very nicely sculpted figure. Teela also has two accessories which include a ray gun that adds a slightly different element to the array of MOTUC ascessories, especially for the ladies. There are some great poses that can be done both with her gun and sword - I just wish that she had a facial expression to back it up. All up, there are two figures which, while they may not make it to the front of the display, certainly add depth to the MOTUC collection. If nothing else,I definitely enjoyed learning more about the Masters of the Universe legend while researching this post! I love that Teela figure! Meh, Teela's okay, I prefer the first version, but I will try to get this one someday. Faceless One, on the other hand, looks fantastic to me. I think the design is spectacular, and I wants him.